Dilantin or phenytoin is a medication given to patients who are experiencing seizures. It is beneficial in its therapeutic range but if it exceeds this level, it will cause symptoms due to the overdose of Dilantin [1, 2]. Dilantin is type of a medication known as an anticonvulsant. This drug has an inhibitory effect that causes a delay from reactivation. This prevents the spread of electrical activity from an irritable tissue to a normal tissue. This effect is desirable in patients who are diagnosed with different types of seizure disorders and status epilepticus. Side effects that are associated with taking Dilantin are drowsiness, vertigo, constipation, irritability, confusion, mood changes and fatigue. One danger of taking Dilantin while being pregnant is the congenital anomalies that can develop in the unborn child. Although this is the case, stopping the intake of Dilantin is not always possible because a seizure that occur during pregnancy can harm both the mother and the fetus. The risk should be discussed with the physician to identify the most viable option [1, 2, 3]. 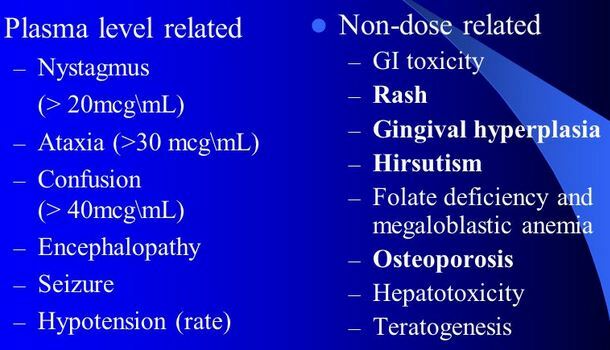 How much is Dilantin Toxicity? The therapeutic serum range of Dilantin is found to be between 10-20mcg/ml. If the blood level reaches 30mcg/ml, that person may start to manifest signs and symptoms of Dilantin toxicity. There are factors which may increase the risk for an overdose in Dilantin. A person with increased risk may manifest toxicity symptoms at a relatively lower serum levels of Dilantin. An elderly may present symptoms of toxicity at a serum level of less than 30mcg/ml. Taking other antibiotics or anticonvulsant along with Dilantin also increases the risk for an overdose [1, 4, 5]. If an individual overdosed on Dilantin, they may present with the symptoms such as vomiting, nausea, low blood pressure and fever. Neurologic symptoms include slurring of speech, lack in movement coordination and development of tremors and seizures. Some individuals even show a jerky, involuntary movement of the eyeballs. Their level of consciousness is also affected and they become lethargic or may slip into a coma [1, 2, 3, 4 ,5]. What is Dilantin Toxicity Treatment? If a person is suspected of Dilantin toxicity, they should be brought to the hospital immediately in order to receive prompt medical attention. Once they reach the hospital, their condition will be assessed. The main priority at this point is to stabilize the airway, breathing and circulation of the patient. If the airway and breathing of the patient is compromised, there may be a need to perform an intubation to maintain the respiratory of the patient. A venous access will be initiated in order to administer fluids and medications. Once the patient is stable, measures to decrease the level of Dilantin in the body can be performed. Activated charcoal may be given to the patient if the ingestion of the drug occurred less than an hour before they were brought to the hospital. It is essential to ensure that the airway of the patient is protected to prevent the occurrence of an aspiration. Blood tests will be performed to identify the serum level of Dilantin. Other symptoms that have appeared will be managed through the use of medications. The patient will be discharged when they become asymptomatic but those who developed complications such as alteration of mental status, seizures and coma may be required to stay in the hospital for a longer period of time for monitoring until they will be well enough to be sent home [1, 2, 3, 4, 5]. How to prevent Dilantin Toxicity? Those who are taking Dilantin should not miss any appointments with their physician. The condition of the patient will be monitored and the dose of the medication may be adjusted. Bottles that contain the pills should be properly labeled and place in locations that are out of children’s reach to avoid an accidental ingestion. Any side effects felt while taking the drug must reported immediately to the physician to prevent the development of complications [1, 2, 3, 4, 5]. Craig, S. (2005). Phenytoin poisoning. Neurocritical Care, 161-170.